Pretty neat stuff. Turtle Talk - where the surfin turtle dude from Finding Nemo interacts with the audience - is the big draw, and is very funny. Other areas about animation are interesting, too. Don't forget to check out the strobe-operated zoetrope. I really enjoyed the visit inside. I was amazed how big the entry area was!! The video screens and music was awesome! My favorite thing about the Animation building was Turtle Talk with Crush. That is such an amazing show. I knew it would be cool, but it exceeded my expectations by a lot! The only (and I mean ONLY) downside of the whole place was that the activity areas (especially the find out which character you are area) is packed and I didnt get a chance at the station. Great exhibit! I liked how you could learn how animation works and you get to make your own. Then I loved the "which disney character are you?" I wound up being Timon. "and remember kids, be sure to keep saying dude all day long, your parents will love yah for it"
my only problem with it was I only got to enjoy it once because of extremly bad timing, but yeah, this probably has the greatest repeat value out of any show at DCA. This ride is an excelent experience! 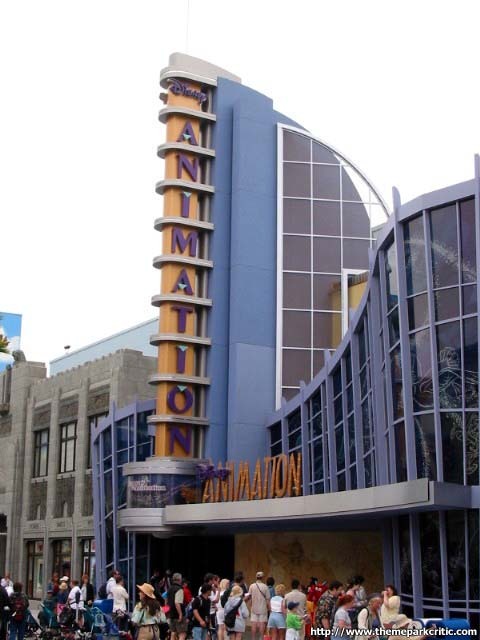 You can see how animation is done, you can voice over cartoon characters in mini clips, and even find out what disney character is most like you! I was Clocksworth!! The Disney Animation exhibit is one where you could essentially spend hours if you had the time. There are two separate shows, plus an exhibit on the development of various Disney characters, plus the Sorcerers Workshop. There is also the center room from which all of these others branch off. This is perhaps the best, yet most underappreciated, part of the entire attraction. It is a huge room that is air conditioned where you can sprawl out on the floor and just look at the walls all around you. Its not a Circle Vision film, as there are different non-continuous screens showing different things, but you get to watch clips of many Disney animated features, while listening to many of their most famous songs. I last visited the Drawn to Animation show, which is quite funny and entertaining, showing an animator interact with Mushu from Mulan, explaining his development. I also went through the Sorcerers Workshop. The best parts of this attraction are the Beasts library, where you can find out which Disney character you most resemble, and Ursulas cave, where the voices of the characters are stolen from several scenes of Disney movies, and you get to reinsert the dialogue (or singing) with your own voice. Pretty fun if you have a big group! I missed the film with Robin Williams and Walter Cronkite, as we just ran out of time. Overall, a must-see. This was pretty cool. We had no idea what it was, just wandered in, spent over an hour in there. The thing I found most interesting was all of the originasl ideas for some of the characters - a lot of the early models look completely different from what the final product was. Worth checking out! 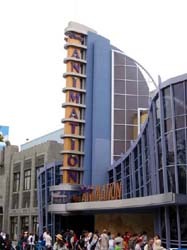 The best animation tour in a disney park. I think it beats MGM Studios in Florida. Classy lobby and beautiful layout. The Walt Disney Movie is a great historical movie that should not be missed, it captures all the disney spirit.